Leave a comment (or do more see here) to win yourself a bag of coffee and some chocolate bars! 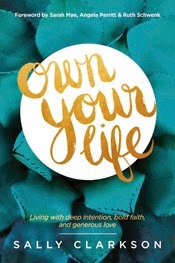 On Sunday evening at our Own Your Life book study group, the topic was owning your emotional health. The thrust of the chapter is that a wise woman takes good care to fill herself up so that she has a well out of which to give to others. And empty well refreshes no one! Sally had many suggestions of "soul-filling habits" and encourages her readers to think about how to weave some of them into their lives. At the end of the chapter she suggests choosing one thing to do in the coming week to fill up your soul. A great idea that, during our group time, we each took time to think about and share what we committed to do this week. In contrast to soul-filling intentionally with good things, our hearts can be filled with the junk that life after the Fall offers us. So another thing I asked our group to do on Sunday night was think of one thing they could let go of this week to make space in their soul for the good stuff! That's what brings us to yesterday's interrupted by grace moment. For ages I have wanted to get my Facebook checking habits under control. Often I'll make some weak commitment to myself, not tell anyone, and then go right back to checking every time I have a spare millisecond in the day! During our discussion my friend Julie mentioned how looking at Facebook at a random time introduces all kinds of thoughts and ideas that at the moment distract her and pull her away from what she wants to or needs to be thinking about and/or doing. That resonated with me. That is exactly what happens! I knew then that I needed to reign in my Facebook checking to eliminate the soul-sucking nature of it. And I knew I'd have to share my commitment with the group - to only look a few set times a day - so I would get some accountability. Mondays aren't normal school days around here, so yesterday was my first day to really try out the less Facebook time. I was interrupted by grace with the clarity of thought most of the day, the increased desire to focus on the kids and be present for them, and embarrassed by how much I thought, I'll check Facebook, throughout the day. Usually my motivations for checking are for selfish, I-hope-I-have-a-notification reasons, so this process is convicting! But I want more room for others and for the Lord in my soul and maybe this little step will help me grow in wisdom and have a soul filled with more good reserves. What's cool, is that Sally gets these ideas from the Bible! Feel free to join in our group's activity for this week and choose a soul-filling habit to start and a soul-sucking one to reign in or kick to the curb! For more ideas, definitely pick up Own Your Life, by Sally Clarkson. Our group has been enjoying and benefiting immensely from reading it. through my eyes, that I may scatter rich smiles in sad hearts. See the below for more info.